It seems like birthday celebrations seem to go on forever for my kids. There are their actual birthday meals, then there might be a friend sleepover or party, and perhaps another celebration or two with family. Everyone expects some kind of birthday treat at each one of them too! Well, I can only handle so much birthday cake. I wish it could just be a one and done thing for birthday celebrations, but since birthdays don’t just happen perfectly timed with a weekend or you have family that lives further away, you end up with multiple celebrations. And even if you’re lucky enough to celebrate the day just once, sometimes you just don’t want some alternatives to birthday cake. 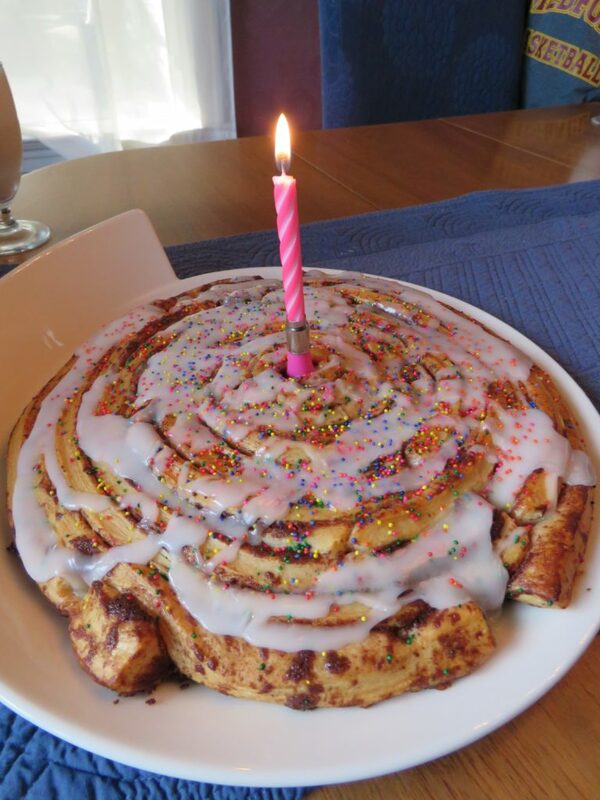 My first alternative to birthday cake is is a “Cinnamon Roll Cake,” which is easily made with 2 tubes of regular cinnamon rolls (not the large Pillsbury Grands kind). Place one cinnamon roll in the center. Then unroll the next one and start to wind it around the first. Continuing doing this until you have used up all the dough. Bake as directed, but you may need to add 2-5 minutes more of baking time. Drizzle with the icing included and add sprinkles if desired. Add a birthday candle or two and you’re done! Is it obvious I have a 10-year-old girl? This is why you will see sprinkles on everything. This might look like a cake, but it is brownies. I think people forget about brownies as an option. You could also make a pan of Rice Krispie Treats and frost that. 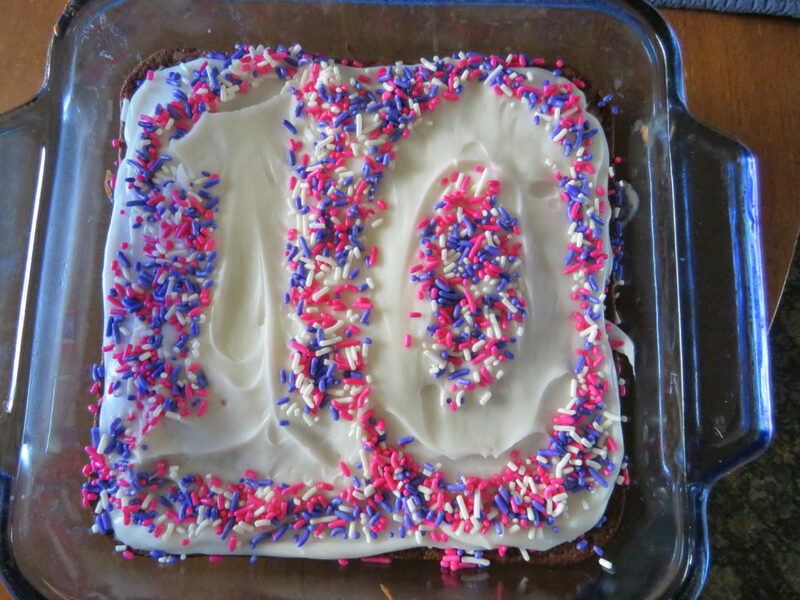 To get the perfect “10” in the frosting, I cut out a 1 and a 0 out of wax paper and put it on top of the frosting before covering the rest with sprinkles. Then I just peeled away the wax paper. Consider making a birthday cake shake! 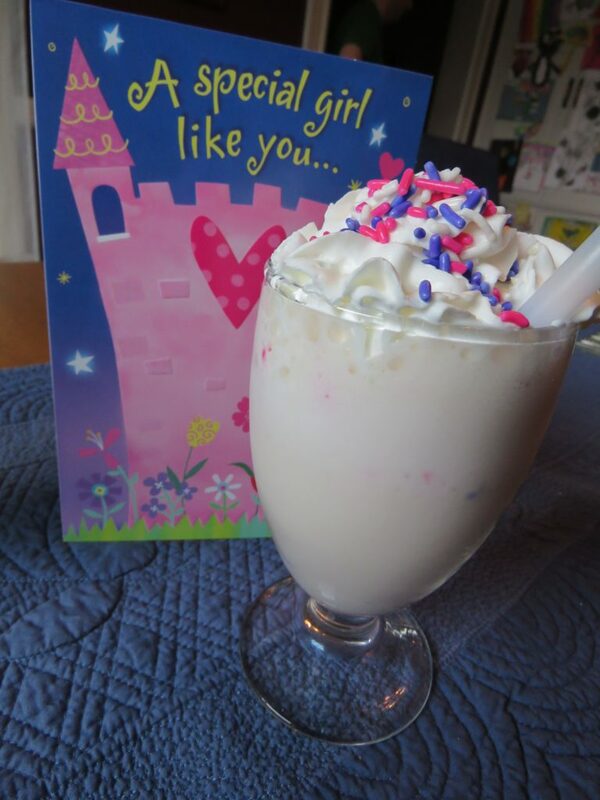 You could use milk and ice cream and make a shake in a blender, but if you are looking for more protein, try out my Birthday Cake Protein Shake Recipe. Regardless of what kind of shake you make, you need a blender. I like using an immersion blender because I make my shakes right in the cup that I will use to drink it out of. I bought mine from Aldi’s when they had it as a special purchase and it came with 2 cups, which is awesome to have. This Hamilton Beach Single Serve Blender has 2 and seems to be a pretty decent price. Or, consider this Magic Bullet Blender, which comes with 3 cups and I have heard really good review about. Another option to consider would be a sundae bar. You could take it a step further like I did and splurge on a waffle bowl maker. Everyone really enjoyed the waffle bowls. 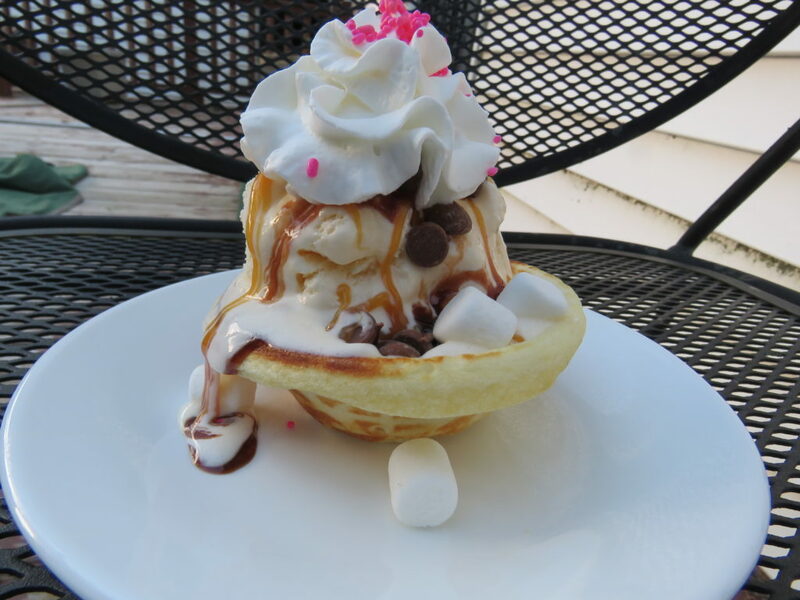 I did learn from this experience that I should make them a little further in advance because I stood in the kitchen making tasty waffle bowls while my daughter delivered two of them every 2 minutes. Birthday pancakes are a classic favorite in our house. There is very little that needs to be planned in advance, as we usually always have the ingredients to make pancakes, and syrup and an abundance of sprinkle choices. The only wild card is if we ran out of whip cream or not. If you want to take your birthday pancakes s step further, check out these Rainbow Pancakes I made for the kids. Sometimes you can have the most fun on a birthday by simply trying things that fall outside of the usual birthday celebrations. These alternatives to birthday cake are simple, relatively inexpensive and can make someone’s birthday just a bit more memorable. awesome post! i usually just go for pizza. what can top pizza? I was never a big cake lover and my Mom used to make me Jello Birthday cakes–actually I still consider Jello one of the major food groups! so, is it a pan of jello with whipped topping on top or what exactly is it? My son loves jello and might like that idea. We still do a regular cake, but there seem to be so many other birthday celebrations that I found alternatives for those. Awesome alternatives that you have here! I really like the brownies with sprinkles, it’s a brilliant idea and it’s really close to having a cake. 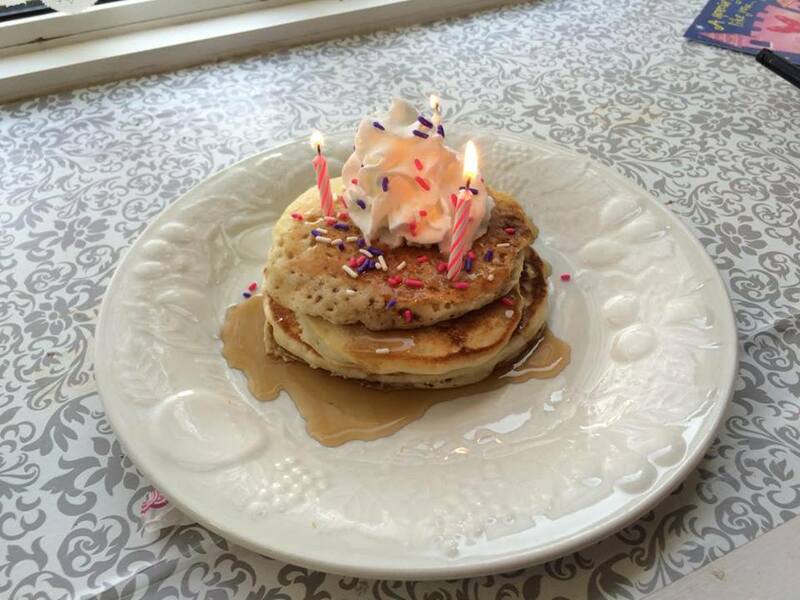 The pancakes are perfect for welcoming the celebrant’s birthday during the morning. I love cake! 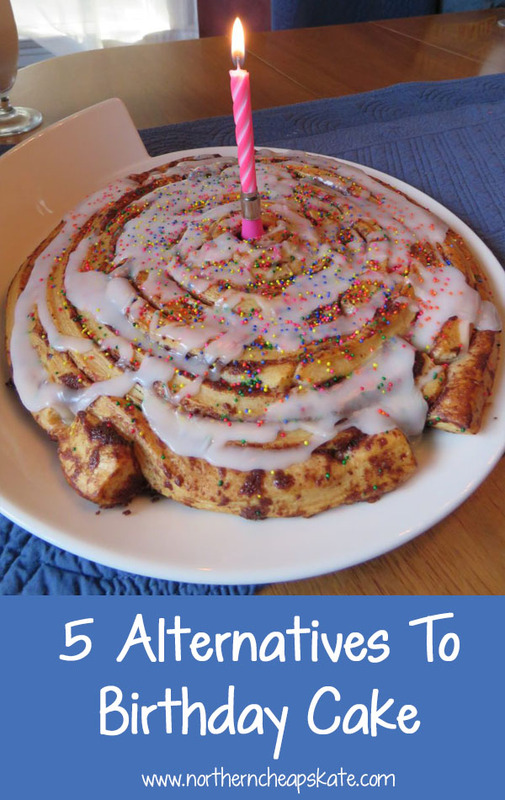 But these alternatives sound absolutely delicious and I could def have any of them for my next birthday! The cinnamon roll was a big hit. My daughter loved that idea. I have a feeling I will be doing it for my son’s soon too! These ideas are really nice especially if you are on a budget, I have celebrated my birthday once with a pancake instead of a cake! For 10-year olds, anything sprinkled and with a candle equals birthday party!!! And that dollop of whipped cream? They’ll expect that to. i suggested a cake made of fresh fruit to a friend who didn’t want to give his one year old sweets. his son is 7 and he’s still making him cakes made from fruit…love it. I have seen the “cake” made of watermelon and covered in whipped topping. I might need to try that. Sounds like a healthy alternative.